What is the tradeoff between using a virtual document object model and straight-forward updating of the dom directly? Surely, an app that inserts a single div in response to user input wouldn't justify the use of a virtual dom . But what is that tipping point? What has to happen in the app in order for a virtual dom to become worth the engineering? Perhaps a benchmark test could start with comparing two apps. One using a virtual dom, the other not, but otherwise the same. Compare metrics like time difference when inserting one element per cycle. Then ten. Then 100. CDNs vs. Bundling and a tool to help. One ostensible advantage of using CDNs is to reduce bandwidth overall by caching commonly shared code on individual browsers. Rather than, say, each app loading its own version of d3, for instance, the CDN delivers the library once for each user, and each website references that same code. I imagine this would work quite well with a popular library like jQuery. Another advantage is that it allows the developer to quickly try out libraries during development without committing the time to download and configure those assets. If the idea or the library isn't working, it's easy enough to roll it back by simply deleting that <script/> tag. Configuring all of this manually can be a bit of a pain, and error-prone, though. Much easier, and this is the route many devs go, is to simply npm all libraries, roll them all up into a bundle using a task runner, and have a single script tag referencing the entire application in a single js file. And, heck, I can't really disagree: loading-time of an app bundled like that is much less than the time to load lots of individual files. It feels less communitarian to do it that way, as it doesn't take into account the overall time-and-bandwidth savings of using CDNs, but I get it. It's safer. Still, since I like the CDN approach so much, I wrote a tool to take some of the pain and risk of error out of using them. Cdnler is a node app that examines the <script/> tags of input html files, downloads those assets locally, and then outputs the html with altered links and fallbacks. Basically, it does all of the above automatically. It's a bit rough right now in the sense that its use case is exactly my own. Within that use case it works perfectly, though. I imagine that it could be useful even to folks who like to bundle their entire app into a locally served script, because it will automatically download all linked assets. I'm happy to expand its usability for other developers, so if you like the idea, but it's missing some ease or usability or feature that prevents you from adopting it, please let me know what that is. I don't often watch videos about coding, but I'm on a jag of it, lately. Picked up a few things on the horizon on the way. GraphQL (an alternative to REST) one of them. CSS Grids another. (And, as an aside, a fascinating video called Braids in Higher Dimensions). One video in particular I'd like to highlight is this talk by a fellow named Lee Byron at an event called Full Stack Fest in 2016. It's longish, but if you're a developer on a videos-about-coding jag, too, and it's currently not much past 2017, it might be worth your time. It's a discussion on immutability, not just in user interfaces, but in the entire server-to-user-and-back cycle (He's essentially talking about React without ever actually mentioning React). But his final words are an articulation of something that I feel many developers, and those who herd them, lose sight of. MVC and REST did not solve all of the problems that we face in app development. But what I've presented today, also won't. These ideas are going to be far from flawless, and they might not be right for the app that you're building. And I want all of us to continue to challenge the notion that there is one right way to do things. It's not true. I encounter often an almost religious conviction about various frameworks and approaches as talismans against writing bad code or buggy apps. I have seen people - decent coders, otherwise - unwilling or unable to code without first finding a framework or an approach that other people acknowledge is the right way to do things™. And then, finding this (non-existent) consensus and carefully following all of those guidelines, frameworks and recommendations, they still write overwrought, overengineered, buggy applications that are difficult to maintain. const doTest= (message, result, expected) => console.assert(expected == result, message, result); // port as necessary to the language of your choice. // or change == to === as you wish. Simple. You can open your browser console right now to see it in action. and then modify your unit test function so that doTest checks to see if the result is an array, and then runs the isEqualArray function. Boom! Your framework now compares arrays. With doTest in place, it's easy to drop a test anywhere meaningful. When you find yourself thinking "This function should be returning x but it's returning y. Hmm." Just doTest("f(x) => y", f(x), y) Then you can get to work solving the problem with a permanent, reliable partner keeping your goal on track. Later, if some fix has broken something critical, you can pin down more easily what part is broken. This will tell you that your test suite is working as expected and make your heart skip a beat at random moments. Always fun. As a final note, obviously there are times when you will need a more sophisticated testing framework. But if you find yourself leaving constructing unit tests until the end, give this 'roll your own' approach a try. You can always easily port your tests to another framework whenever necessary. Well, I can say that the 'map' now looks more and more like an 'app'! Click here to see it. It has severe UX issues, but it has a rudimentary search functionality, and some responsiveness. The search bar is in the upper left. Try it out! Edit: D'oh! It fails in iPad Safari. That's going to take a minute to troubleshoot. 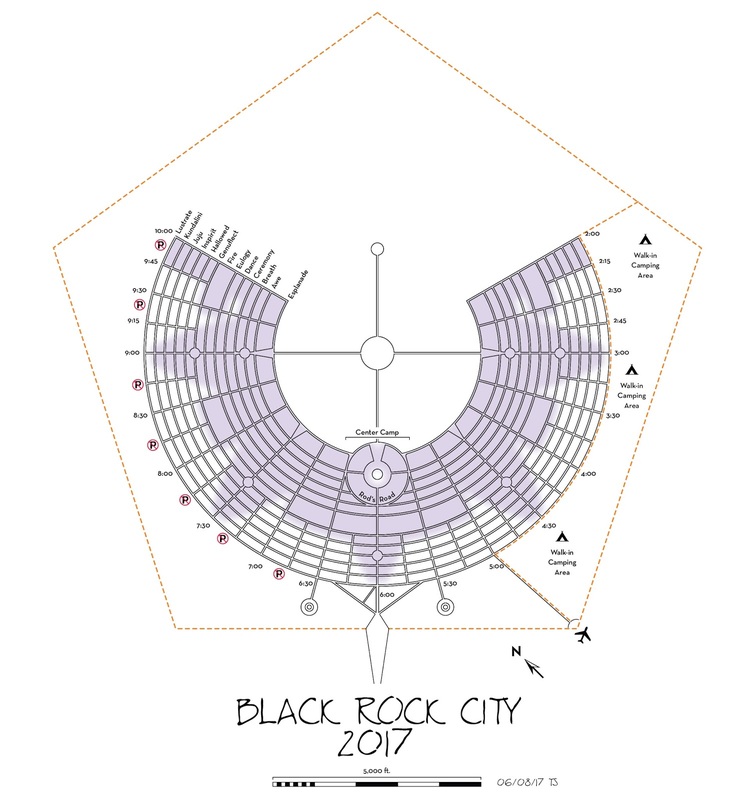 Edit: (The original title of this post was Black Rock City map complete) Ah, it's an old truism in software development never to label something as 'complete', 'finished' or 'final'. By 'finished' above, I meant only "I has a map". The project itself is not finished. I've since added zooming and panning capabilities. To do that, I just grabbed a library (svg-pan-zoom by ariuta)which did the essentials of what I wanted, out of the box. However, because SVG's coordinate system increases from top to bottom, but real-life GPS increases from bottom to top (i.e. 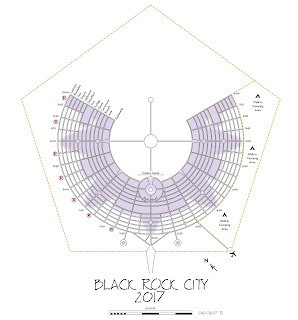 south to north, at Black Rock City, anyway), I had used SVG's transform attribute to reverse the vertical scale. 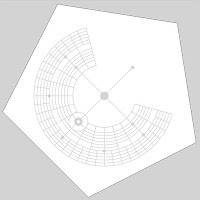 While this allowed an exact mapping between the map's xy coordinates and actual GPS coordinates, this also caused the svg-pan-zoom library's vertical panning to be reversed, as in airplane controls. It took some thought to translate GPS data with distances in feet, into SVG's xy-origin-at-upper-left coordinates. To make sure that everything is as it should be, for now, real GPS coordinates correspond to actual xy coordinates on the map. e.g. 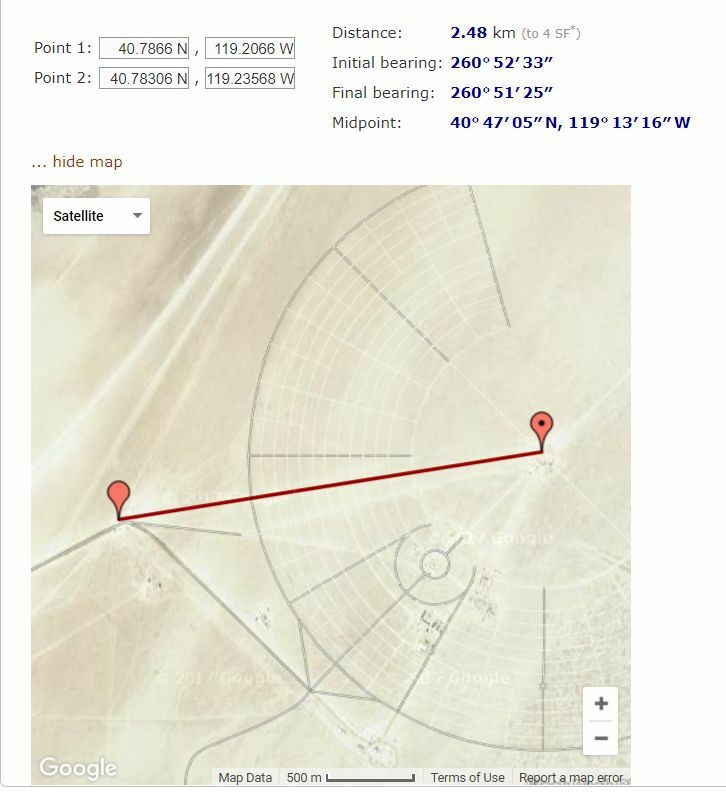 "the golden spike" at 40.78660,-119.20660 in GPS is represented in the SVG graphic as <circle cx="-119.2066" cy="40.7866" r="0.0005" fill="gold"></circle>. Note how the coordinates are identical. The problem with this is that it's necessary to zoom way, way in, because the distances involved are tiny. For example, the distance from "the golden spike" to one of the pentagon corners is 8,175 feet, but in "GPS units", it's only 0.0293. Just a single foot is 0.000003! 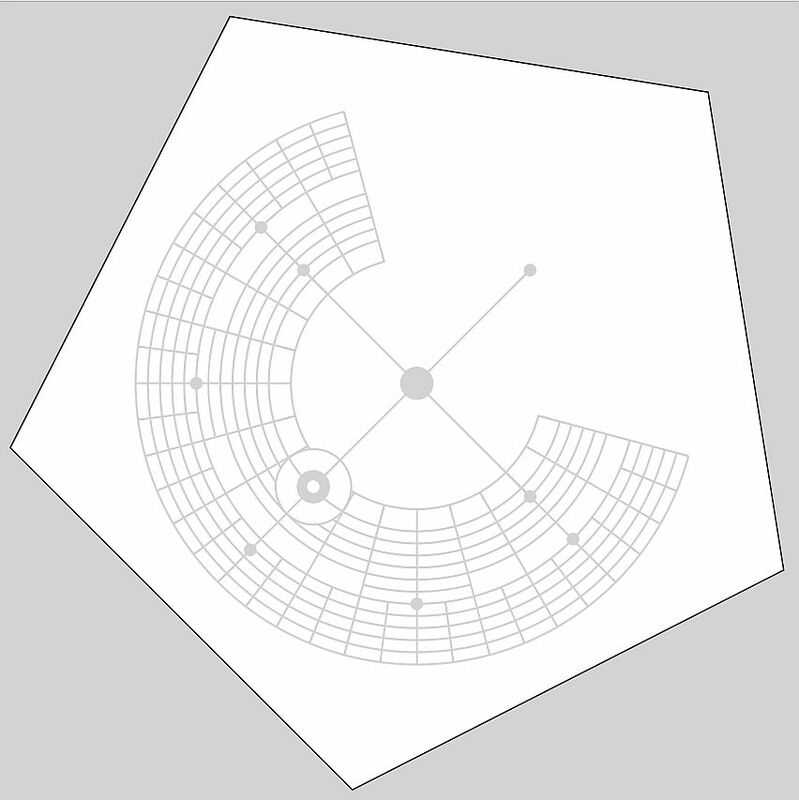 The width and height of the whole thing is only 0.7 x 0.6 (in SVG's unit-less distances). Such tiny numbers makes dealing with fonts difficult. But it is pretty neat, to just be able to grab a coordinate and stick it in without modification, so I'll experiment before deciding to scale it up. Adding to my confusion is that the official GPS coordinates[pdf] for the enclosing pentagon appear to be way off (or my mind is way off). I assumed it was my transformations somehow, which is why I took extra care to make sure that there was a one-to-one correspondence between GPS coordinates and a spot on the SVG map. 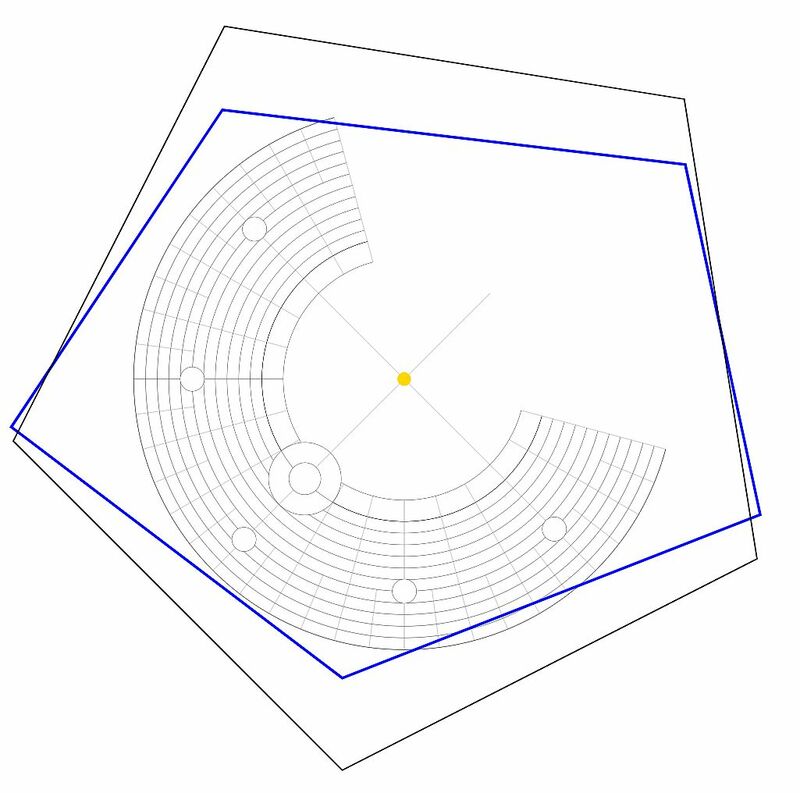 There are now zero translations or transformations of any coordinates, but the official coordinates make a sad and collapsing pentagon (here shown in blue). Way off, right? It looks like it was crushed! The really odd thing is that the coordinates match Google maps almost exactly. 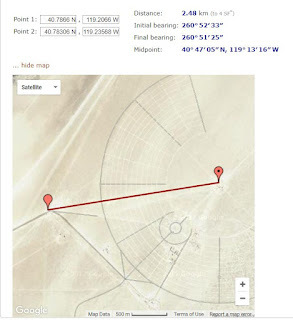 If you enter those coordinates into Google maps, the marker will land almost precisely on the pentagon corners of last year's satellite photo of Black Rock City. Strange. If you have any ideas about what happened, here, let me know! I'm still baffled. 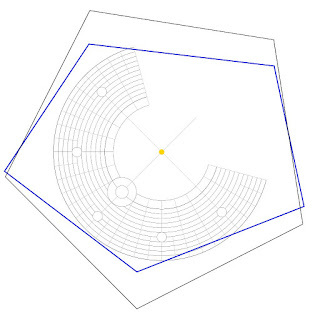 Edit: When I calculate the distances to the Man from each of these official pentagon corners, I get these values for each, which are consistent with the visuals. They should all be equal, and they should all be more-or-less 8175. As you can see, they vary from a few hundred feet to over a thousand. The mystery deepens, but so does my confidence that it's the data and not me! By contrast, these are the GPS values I'm using, generated by calculating 5 points 72° apart on a 8175 foot radius from the golden spike coordinate. Interestingly, one of the points almost corresponds. The order's not the same, because I generated them widdershins from high noon. I don't know if I will ever set it up to be an actual, full, proper app, but for now it's fun to see pie charts of the types of scheduled events, or bubble charts of theme camp surface area, or bar charts of the number of events each theme camp is hosting. I'm using Ramda.js to keep the data flow reasonable. As I develop it, I will likely use Rxjs to make interaction states easier to reason about. If I do choose to tackle this, my approach will use a combination of normalization and regex to extract locales from the data, and then mapping to get a canonical spelling. At this point, though, I feel like answering this challenge would cease flow on more interesting challenges. So why not simply leave it? In other words, why not simply treat the camp with the hometown of Los Angeles, San Francisco, New York as in a distinct bucket from San Francisco, Los Angeles, New York? Well, that's what I'm doing, for now, but it feels inelegant. If the data will impart any insights with respect to understanding where camps are coming from, it will need to be done. But, this project is about exploring the d3 framework in a fun way, not getting bogged down in implementation. So, moving on. My friend's elderly aunt died recently, and today we went to her funeral. There are a few differences between funerals in the US and in Finland, so if you do ever find yourself going to a funeral in Finland, here are a few tips. Keep in mind, though, that Finns are a gracious and laid-back people, so if you find that you have been unintentionally weird and foreign, they want you to feel at ease. "Ei se mitään", they say. It's nothing. It is more important that everyone feel comfortable than strictly adhering to protocol. Tip #1, is that pall bearing is no joke. In both countries, it is as close to a sacred duty as you will come, of course. But in Finland, there is no room for error, no tricks. You will carry that coffin, and you will put it in the ground. If you cannot carry heavy weight, if you even have doubt about it, do not pick it up. You seriously risk disaster. No, nothing bad happened at my friend's aunt's funeral, but there was no backup if even one of us pallbearers failed. The second is that, in the US, there has been a shift away from solid black dress. Patterns are ok, hues are ok. As long as your clothes are not outright festive, you will be okay. In Finland, no. Dress only in solid black without pattern. If you are a man, wear a white shirt with your black suit. It is important that your outfit not be fancy. Do not demonstrate your sartorial sophistication. You do not want to stand out. The third difference is that Americans smile a lot. Even at funerals, wakes, memorials and such. Lock that down. Finns smile less than Americans in general, and at funerals in particular. Do not wear a brave or comforting smile. It will come off as weird. The fourth tip: bring a change of more casual clothes. It is possible that you may be invited to someone's home afterwards, and they will likely immediately change out of their funeral wear. You will feel more comfortable, yourself, if you can. My young son is going to daycare on Monday for the first time. He will be 2 in October. We're taking him there and spending time with him there, so he gets used to it and isn't so afraid when we leave him there. The teachers are nice. My life events and career as a json file. Then it can be the data for all sorts of presentations and filters, including a resume. I'm not really a fellow who has documented his tasks and accomplishments for posterity or others. Nor have I felt comfortable talking about real-life events on the Internet. I'm too much of a perfectionist. Flaws in grammar or execution gall me. What if I express an opinion that dates with time? But I've decided to toss those kinds of concerns, and just write. I would rather you know who I am and what I think, even if the thoughts are sketchy or incomplete. No one is fooled by a polished exterior. One technical approach to one bilingual website. I am updating my website, and I want it to be bilingual, supporting Finnish. The technical solution I'm thinking to employ will be to serve the same page irrespective of language, but alter its content on the backend before serving it. Since the Finnish version will be hosted at fi.rendall.tv, but it essentially just points to rendall.tv it's a simple matter to see if the request URI is prepended with fi, and use that information as the "use the Finnish version" flag. Otherwise, just serve whatever page is asked for by default. As an overview, to serve the Finnish version, I will most often just take the English version, and swap out each instance of English content and replace it with a Finnish language translation. On occasion it might be necessary to present an entirely uniquely formatted page for the Finnish version. And, of course, if there is no Finnish language version, I'll fall back to English. So, in some detail, every html request to rendall.tv will be received by a controller that first checks to see if the request URI has a 'fi' at the beginning. If not, it'll just pass through the request. If there is a fi in the URI, the controller will first check to see if there is a Finnish-language version of that page: the same filename, but with .fi appended to the filename (e.g. fi.rendall.tv/index.html request will look for index.fi.html), and if so, will serve that directly (as index.html). That covers the comparatively rare case of complete Finnish re-formats. If there is not a full Finnish version of that page, the controller will then look for a similarly named static file (e.g. index.fi.txt) that will map a bunch of key-names to translation values. This static file will be used to alter the requested file and present a Finnish version. HTML tags with the attribute data-translation="<key-name>" get their inner HTML replaced by <translation-value> in accordance with the mapping. It's important that there be an option to alter the actual inner HTML, not only the text. Now my name renders properly, and won't break apart. Problem solved. For English. But! The translation for "Welcome to the personal and professional website of Rendall Koski" in Finnish is "Tervetuloa Rendall Koskin persoonallinen ja ammatillinen verkkosivuun"*. If my scheme only allows for straight text translations and no HTML, swapping this in would blow away my span.nbsp-fix above, and then I'm back to having either no nbsp; or stupid-looking RendallKoskin. Tervetuloa Rendall<span class="nbsp-fix">&nbsp;</span>Koskin persoonallinen ja ammatillinen verkkosivuun! * I have not yet verified these translations with a native Finnish speaker. Facebook brings so many wonderful things to the world: connection to long-unseen acquaintances; community organizing; updates from friends and family. Facebook is catholic, so to speak. The cost, of course, is placing our thoughts, ideas, memories, pictures, opinions and habits into a closed, for-profit ecosystem with dubious ethics and the tendency to meddle with the presentation of that content (and the content itself) like a scolding, self-serving parent. Their algorithm for content curation is opaque, and designed, at best, to maximize their own advertising revenue. Attempts to remake Facebook as another website will fail. Logging into a website held on private servers, in order to see or share or participate, exactly replicates the issues that Facebook has (e.g. 'Ello), no matter how ethically its owners promise to behave. Control and presentation of your content, of your identity, of your opinion, is still in the hands of other people. The only way to solve the problems of these closed gardens like Facebook is to give every individual total control over their own content, and over the content feed they see. I'm talking about a paradigm shift in social media. I'm not talking website, I'm talking protocol. The web, exactly as we have it now, with our websites and blogs and such; but we subscribe to them, and receive them when and how we want them. So, my pitch is: Existing technologies such as RSS, open IDs and authentication, blogging software, etc, can, glued together with the right protocol TBD, will allow individuals to have more control over their own data and identity, while still allowing all of the good that Facebook and other social media actually bring to the world. Individuals host their own equivalent of the "Facebook wall" (or hire a host), and can subscribe to other "walls". Posting on your "wall" can have different levels of security - available to trusted audience or public, rather like Facebook is. Only, you own it. A free, open-source protocol that emphasizes interoperability and user control would allow devs to create any kind of client that suits them. Competing clients, and competing hosts, with competing revenue models, will lead to all kinds of UX solutions, not just the one handed to you by the hegemony. Those who hate scrolling such as yourself will create and gravitate towards clients that solve that. This is obviously only a roughly sketched idea. I actually see this future - of a distributed social media - as rather inevitable, whether or not I work on it. The more that social media becomes essential to our lives, the less willing we will be to settle for our social networks and identities to be controlled by others.